If you’ve been to a school fundraiser, church social or family reunion in the South*, you’ve had some version of this smorgasbord, also called Mexican Fiesta or Mexican Pile-on. The entire spread feeds many and everyone can find something they like. I suppose there are as many versions as there are events to serve this meal. In my oh so humble opinion, there is my Mom’s way** and all the wrong ways, but this is a hack. A shortcut. A quick easy way to enjoy the flavors without wondering where to store a gallon of chili or three quarts of instant rice. Brown 1 pound 90/10 ground beef. Use turkey, venison, bison….whatever you like. This batch was seasoned with 1/2 C store bought pico de gallo (diced onion, tomato, jalapeño pepper), 1 T garlic salt, 1 tsp Chipolte powder, 2-3 T regular chili powder, 2-3 T water. I’ve also used store bought GF taco seasoning and like it too. The key is lean, and quick! 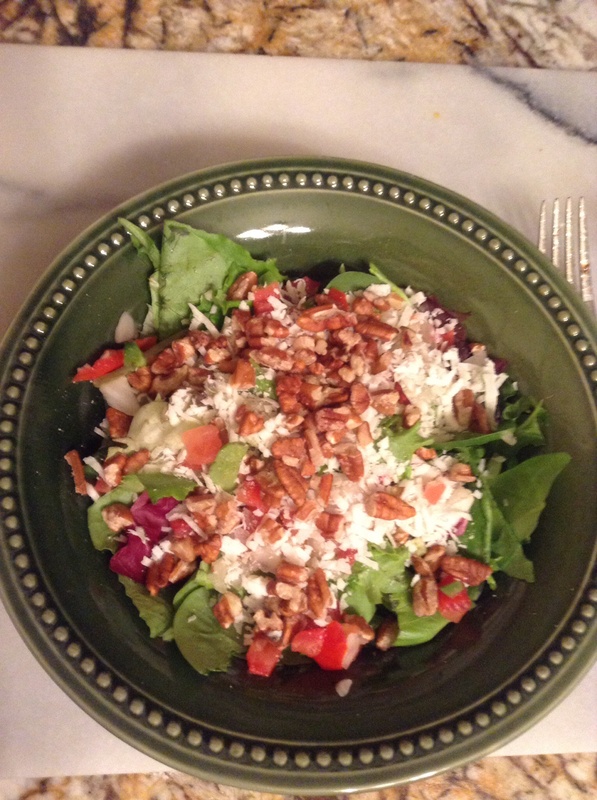 In a soup/salad bowl, add mixed greens. Get creative! Iceberg is boring. Baby greens, leafy lettuces, cilantro…all available pre-washed and chopped. About 2C pictured. MY favorite components of Mexican Stack are coconut (fresh or unsweetened, it has enough flavor on it’s own) and pecans, so I sprinkled on a bit of both along with a few spoons of the same pico used in the meat. If I have one I like a little avocado too. 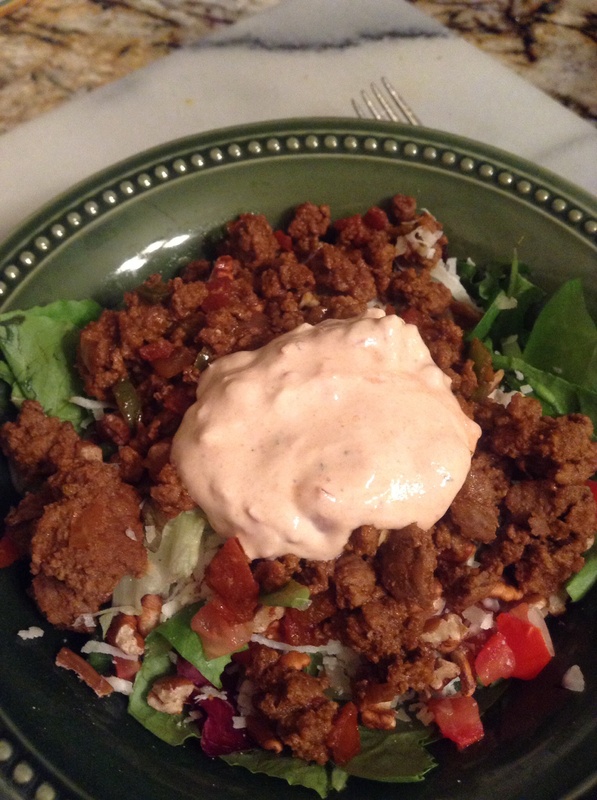 Mix together 2T plain yogurt or sour cream and chunky salsa. Again, BEST to make your own, but commercial is convenient. Watch out for added sugar, preservatives and hidden gluten. There are several GF salsas on the market now. Top lettuce mix with 1/4C ish of the meat and dress to taste. 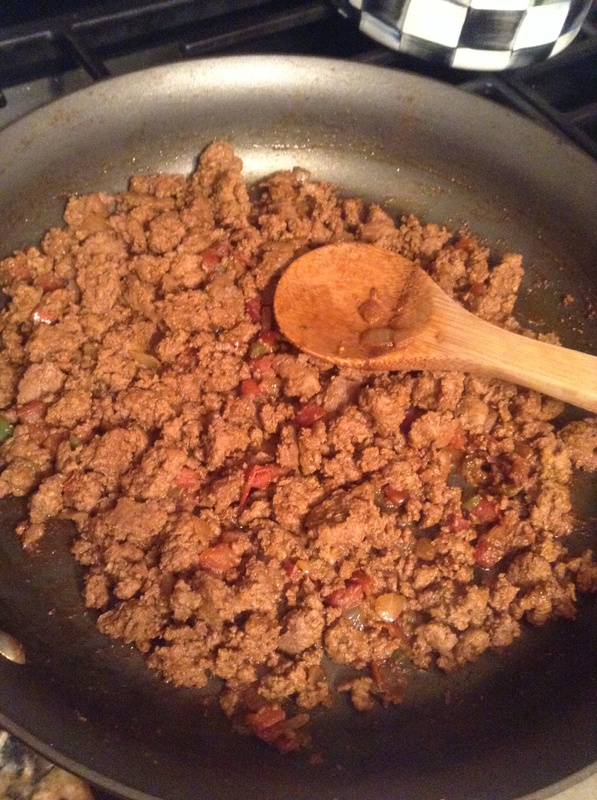 From start to table…including defrosting the ground beef…this meal took me less than 30 minutes. I will probably get 5 salads out of this one batch. Leave a reply on "Mexican Stack Hack"